Legends, myths, old wives’ tales; whether you’re talking about Big Foot, the Loch Ness Monster, or how long you should wait to swim after eating, understanding what’s true and what isn’t can save you a lot of time, and more importantly money. When it comes to your home, time and money are two significant things. This is why distinguishing facts from myths about the process of a cash-out refinance loan is so crucial. 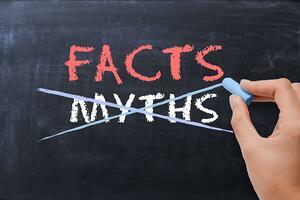 Here are five common myths about cash-out refinancing, and why they aren’t true. If you took advantage of low-interest rates several years ago, you might be under the impression that you can’t refinance again. The truth is that there are no limits on how many times you can refinance your mortgage. The money you get from your cash-out refinance can be used for many different things. Many people use these funds to update, repair, or renovate their home. The money can also be used to consolidate high-interest debts like credit cards and other loans. Reducing, or eliminating these obligations can lower overall monthly payments, depending on your situation. Believing that removing the equity from your home and starting a new mortgage leaves you with “nothing” is a common misunderstanding. This statement is inaccurate in a few ways. First of all, most lenders only allow you to borrow up to 80% of the equity in your home; leaving 20% intact. Also, you don’t lose the equity, you hold it in cash now, as opposed to value in the home. If you use the funds to make improvements to your home, equity can be quickly added. Interest rates do not directly influence mortgage rates. However, when the Federal Reserve increases rates, mortgage rates tend to follow. This does not mean your opportunity to refinance your mortgage is gone. Depending on the amount of equity you take in cash, how you use it, you can save money monthly, in spite of a slightly higher interest rate. Many homeowners believe that refinancing can only change the rate and/or term of their existing mortgage. .While your rate and term may change the timing of a cash-out refinance, the goal is to access the equity in your house by taking cash out. You may select the same term and will get the market rate. These are only some of the common misunderstandings that surround a cash-out refinance loan. The home loan experts at Standard Mortgage (NMLS#: 44912) have been assisting homeowners in financing and refinancing their homes for the past 90 years.